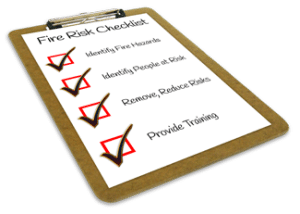 Fire Risk Assessments – Make sure you comply! In 2006 the government implemented the regulatory reform fire safety order. This piece of legislation was called The Regulatory Reform (Fire Safety) Order 2005. It made it compulsory for all premises (with the exception of private dwellings) to have a fire risk assessments in place. MJ Fire Safety understand the importance of ensuring that fire risk assessments are suitable and sufficient. Failure to have or act on a fire risk assessments significant findings can result in prosecution. Consequently many have fallen victim to losses which could have been avoided or minimised had a suitable and sufficient fire risk assessment been carried out. Fires ruin lives and also businesses. As a responsible person in charge of a commercial business or residential premises with common parts you’re required to have a fire risk assessment in place. In addition if your business employs five or more people the significant findings of the fire risk assessment should be recorded. Without a written copy it would be near impossible to prove you have had a fire risk assessment undertaken. Due to the above we would advise all businesses to record the assessment, even those with less than 5 employees. Fire risk assessments should be carried out by a competent person. Hence there is little point in sending a fire risk assessor that specialises in residential blocks to assess the fire safety on a power station. MJ Fire Safety have independent fire risk assessors to provide expert advice and also assessments to businesses across all sectors. We offer a one stop shop to help implement the additional control measures highlighted on your fire risk assessment action plan. If you’ve a fire risk assessment in place but you require guidance or help fulfilling it’s requirements contact us today. Our fire risk assessment compliance team have years of experience in this field. Therefore we are comfortable working alongside fire risk assessors to ensure you and your business is kept compliant. If you have any questions regarding your obligations contact MJ Fire Safety on 0800 027 2480. Alternatively please email us and we will get back to you in due course.